After murdering his elder brother, Marlet must flee the broken town of Victory. With his sword, our low-hung handed hero maneuvers his way through a decrepit southern desert murdering blank-skinned men, being pursued by his illegitimate son, and deceiving those he encounters. All the while, Marlet holds on to his precious memories of Edie, the widowed wife of his brother. 1st Printing: Small Doggies Press 2013. Type set in Bell MT Std and Hoefler Text Black Swash Small Caps. *Book is $12.95 + $2.50 shipping and handling. In turns naturalistic and fantastic, Brian Allen Carr has crafted a truly original tale. This Texas landscape is a mix of country and blues. Larry McMurtry sings Robert Johnson. And then there’s the sword. This book is beautiful. You’re going to hell if you don’t buy it. I mean that. Carr is a man with magic inside his heat. Read this book and meet a man who will love you forever. Live. Live. Read Carr. You will be alive. FINALLY. In Edie & the Low-Hung Hands, Carr’s alternate world is reminiscent of Denis Johnson’s Fiskadoro – dreamlike, haunting in its dystopian aura, and fully imagined. The humanity of his characters is never lost, despite the violence and strangeness of their existence. I would like to personally refute any claim that the author of this book is a gentleman. 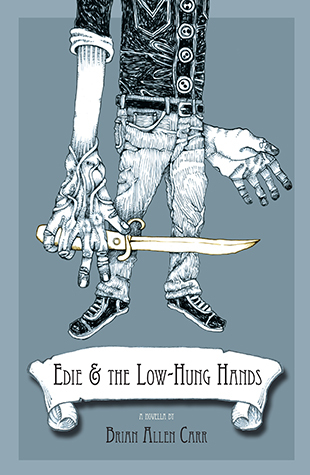 Brian Carr’s Edie & the Low-Hung Hands is funny, odd, poetic, and beautifully written. Read it, and ride toward Victory.